Media captionCarlos Ghosn says he has been the victim of "backstabbing"
Nissan ex-boss Carlos Ghosn has accused former executives at the firm of "backstabbing" and says he is innocent of all charges against him. In a pre-recorded video released by his legal team, he said he was victim of a "conspiracy" and wanted a fair trial. Nissan said in response that there was "substantial evidence" against him. "Aside from any criminal matters, Nissan's internal investigation has uncovered substantial evidence of blatantly unethical conduct," the company said. "Further discoveries related to [Mr] Ghosn's misconduct continue to emerge." Carlos Ghosn is trying to seize the initiative. The man who was once one of the most powerful figures in the global motor industry has suffered months of indignities and humiliations. Now he seems determined to tell his side of the story - even though he is in prison once again. His argument is simple. The charges against him are false and he has been the victim of a conspiracy orchestrated by managers at Nissan, who were afraid of losing their influence within the Alliance - the global carmaking group that also includes Renault and Mitsubishi. But - and it's a big but - he hasn't offered much here to back up his defence. Just a bald statement that he's innocent of the charges. Nissan is having none of it. The company insists it has evidence of "blatantly unethical conduct" by Mr Ghosn and says further material is still emerging. Which brings us to another aspect of his statement: his plea for a "fair trial". Something he suggests his lawyers aren't very confident about. 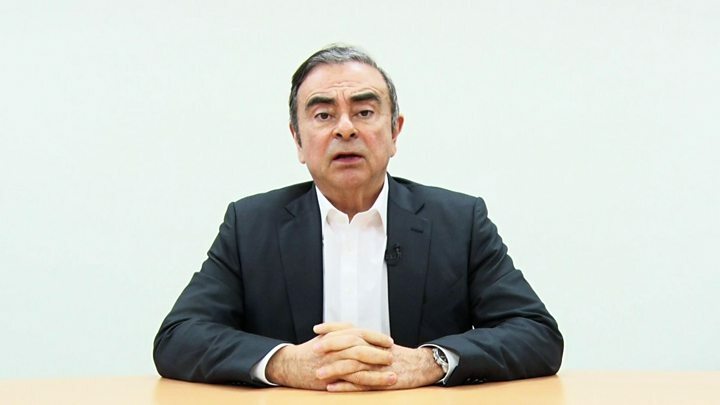 That looks like a comment designed to cause maximum embarrassment in Japan, already squirming under the harsh international spotlight cast upon it by Mr Ghosn's arrest and detention. "This is about a plot, this is about conspiracy, this is about backstabbing - that's what we are talking about," Mr Ghosn said in the video, released at a news conference. The fall from grace for the industry titan has attracted global attention. It has also put a spotlight on fighting within the carmaker alliance and on Japan's legal system. His wife Carole Ghosn has flown to France to ask the government there to intervene on her husband's behalf. Prosecutors said Mr Ghosn's latest arrest related to transfers of Nissan funds totalling $15m (£11.5m) between 2015 and 2018.